People’s World is pleased to share with its readers the following article from the international edition of the Cuban newspaper, Granma. It features an interview with Emile Schepers, a regular People’s World correspondent on U.S. politics, Latin America, and international affairs. Schepers also serves as the International Secretary of the Communist Party USA and was recently interviewed in that capacity by Granma. The original Spanish-language edition of this article can be read here. The Communist Party USA (CPUSA) has been receiving membership requests ever since Donald Trump was elected President. U.S. citizens with Marxist ideas were among the first to organize following the October Revolution of 1917, while their party, founded in 1919, is soon set to celebrate its 100th anniversary. 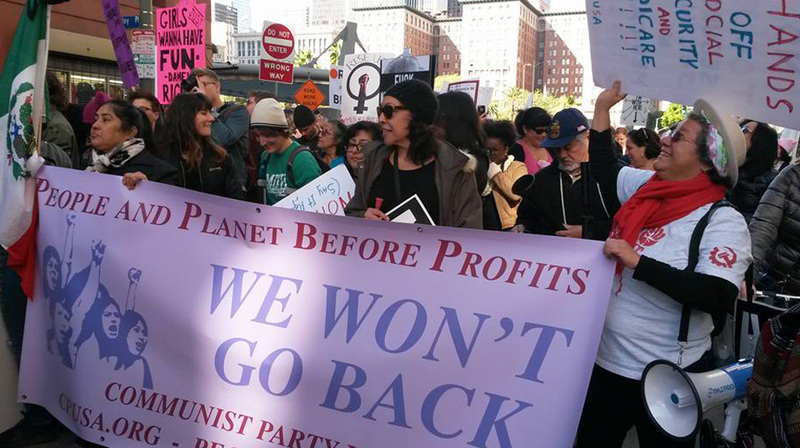 Since its establishment, the CPUSA has lived through the inter-war period and Cold War repression, which practically forced the organization underground. Of the country’s 300 million inhabitants, the organization currently has some 5,000 members nationwide. An anthropologist by profession, Schepers was born in South Africa but moved to the United States when his parents emigrated to escape apartheid. He grew up in the rugged and breathtaking landscape of the Adirondack mountains and joined the CPUSA in 1987, although his association with Marxist ideas began much earlier during periods of his life spent in the suburbs of Maryland and a Puerto Rican neighborhood in Chicago. “Neither recent Democratic nor Republican administrations have been able to resolve the serious problems affecting the majority of the country’s citizens,” he noted. “History tells us,” according to the CPUSA leader, “that popular discontent doesn’t always take a progressive route.” He pointed out the way in which, in the most recent U.S. election, ideological manipulation unleashed a right-wing upsurge. Schepers highlighted that in his current home state of Virginia not only the wealthy, but also many poor whites, came out to vote for Trump. Coal mining is the main source of employment in the area; however thousands of workers have been laid off over recent years. The Republican campaign focused on pointing the finger of blame toward Barack Obama’s environmental policies. Meanwhile, millions of youth mobilized in support of the progressive ideas of Bernie Sanders during the Democratic Party primaries. Schepers is convinced that if the Vermont Senator had been Trump’s opponent, he would have won. “It’s very difficult when the mass media are controlled by corporations and local news stations in the interior of the country only broadcast preachers announcing the end of the world,” he noted. Schepers went on to say that the CPUSA aims to educate and share its ideas with as many people as possible, by all means possible. In regards to the web, the organization has a site which features the party’s manifesto, its actions, and information about how to join. However, the great challenge according to the CPUSA official continues to be organizing workers and trade union structures – without interfering in their internal affairs – around defending the rights of the most vulnerable workers. The CPUSA also supports the Palestinian cause and opposes U.S. militarism. It has supported the Cuban Revolution for many years, and more recently the Bolivarian Republic of Venezuela. The announcement over two years ago that the U.S. government would seek to normalize relations with Cuba was welcomed by the party. “December 17, 2014 took us by surprise, but it was good news. Obama didn’t do everything he could, although he advanced in some aspects,” noted Schepers. Despite this, he believes that support to end the blockade is growing among both Democrats and Republicans in the U.S. Congress. He explained, “Some are motivated by humanist sentiments and others by economic interests, but both oppose the policy.” The only sectors which continue to support the blockade are the ultra-right, and in particular the Cuban-American community in Florida, he highlighted. All recent polls show that the majority of U.S. citizens support the re-establishment of diplomatic relations between the two countries. “We don’t know what Trump might do, whether he is going to listen to the voices of the ideologues or the people, but in general we U.S. communists are optimistic,” Schepers said.